Aegerion is developing a single drug, lomitapide, for a severe, orphan disease known as homozygous familial hypercholesterolemia (HoFH). Their main rival in this pursuit is Isis Pharma $ISIS and their drug KYNAMRO (mipomersen). Learn more about these drugs and HoFH here. Both drugs have pending New Drug Applications (NDAs) with the FDA, and the PDUFA decision dates are in January 2013. Draft version of the questions the panel will discuss. There is also a single voting question. Briefing documents prepared by the FDA and by the Sponsor (Aegerion). Note that you only really need to read the FDA version. FDA Briefing Documents - what have we learned? Find below some key information and comments from the FDA briefing documents released 10/15/2012. Most of the document is from the clinical reviewer (Medical Officer), but there are also comments from Clinical Pharmacology, Statistics, Pharmacology-Toxicology, and the Risk Evaluation and Mitigation System (REMS) staff. Note we heard nothing about chemistry/manufacturing/controls because this is not a topic of discussion for the committee. Comments/questions in italics are my thoughts, otherwise they reflect the comments of the FDA reviewer in the briefing book. FDA mentions possible drug-induced fat accumulation in intestine and lung as well, but in much less detail. 11/2009 end of phase 2 meeting to discuss broader populations- agency raised concerns over carcinogenicity study results. FDA would allow refractory heterozygous FH trial, but AEGR also must do high risk HeFH trial, and may need clinical outcomes trial. AEGR has not pursued any of these options, at least in part due to financial constraints. It seems unclear whether lomitapide would be approved for patients with liver related abnormalities based on clinical pharmacology comments - what portion of the market would this represent? 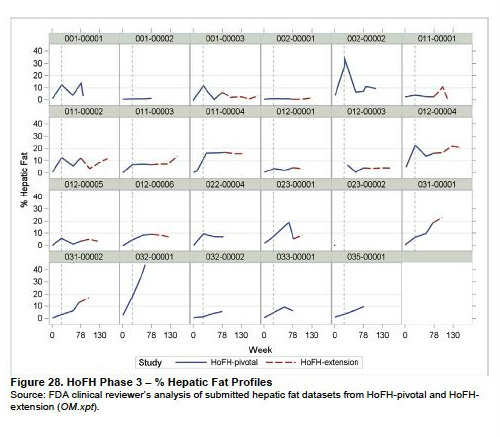 substantial fat accumulation even in the clinical trial with lower risk patients at lower doses of 2.5-10 mg.
weak evidence that hepatic fat accumulated is associated with high LDL declines, but limited power to see such an effect with 22 patients (Isis claims that there is such a correlation - we will see what their briefing document say tomorrow). 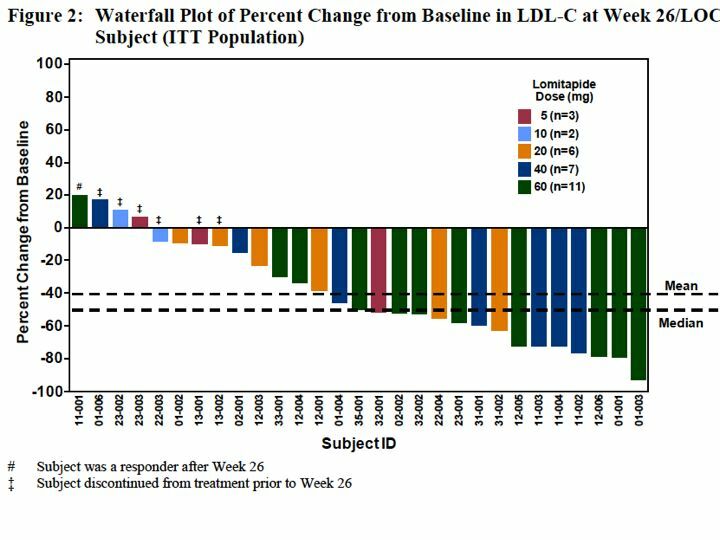 Statistical reviewer: the trial showed that the drug was successful in reducing LDL-C, total cholesterol, ApoB, triglycerides, non-HDLC, and V-LDLC after 26 weeks of treatment and maintained through 56 weeks. No efficacy difference between 40 and 60 mg doses. 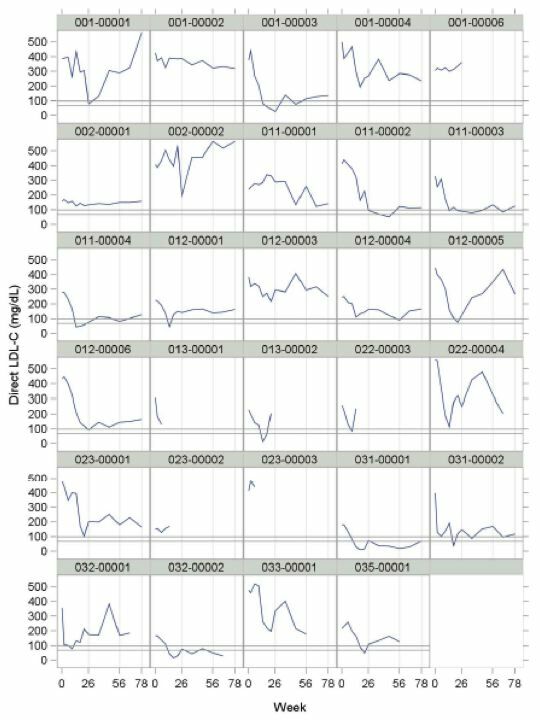 LpA reduced only at 56 weeks not 26. "It is unknown if long-term exposure to lomitapide will cause irreversible liver injury. The potential for progression of non-alcoholic fatty liver (NAFL) to non-alcoholic steatohepatitis (NASH) is unknown, but should this occur, the potential consequences could be severe. Patients would be at risk for cirrhosis and liver-related death. Because of the severity of vascular disease in patients with HoFH, they may benefit from treatment with lomitapide, even though the liver safety issue has not been fully characterized." Goals: educate prescribers, limit access. Certify prescribers and pharmacies, give Medication Guide to patient. No enrollment or specific patient monitoring will be required.